Mayor’s Note: I’ve had so many questions from social media followers about our yurt stay that I’m very thorough in this post so that those of you who are considering a yurt stay will know exactly what to expect. Being thorough means that this post is much, much longer than usual, but I decided against breaking it up. I’d never given yurts a second thought until Snowmass Mammoth Festival last summer. The festival’s media “tent” was actually a yurt and after spending two days hanging out in it, Ryan and I had been bitten by the yurt bug. 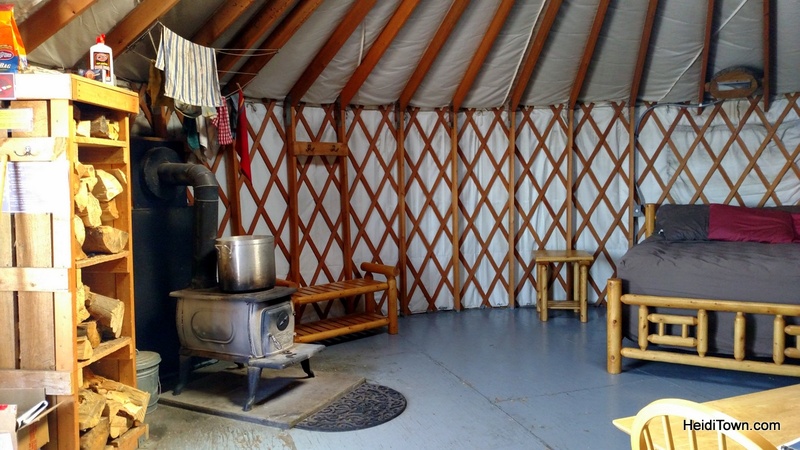 While visiting Montrose this past fall we toured the Colorado Yurt Company, the folks responsible for many of the yurts you see around the state and beyond (including the Never Summer Nordic yurt highlighted in this article). 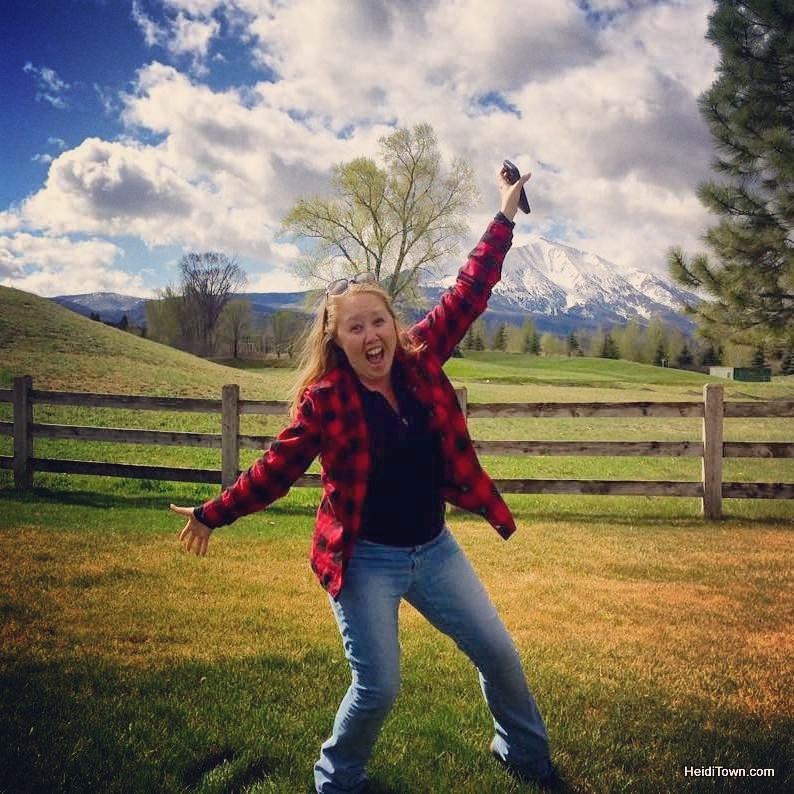 Our visit to Colorado Yurt Co. only fueled our interest in yurts so when I got the opportunity to do a yurt stay, I jumped at it. 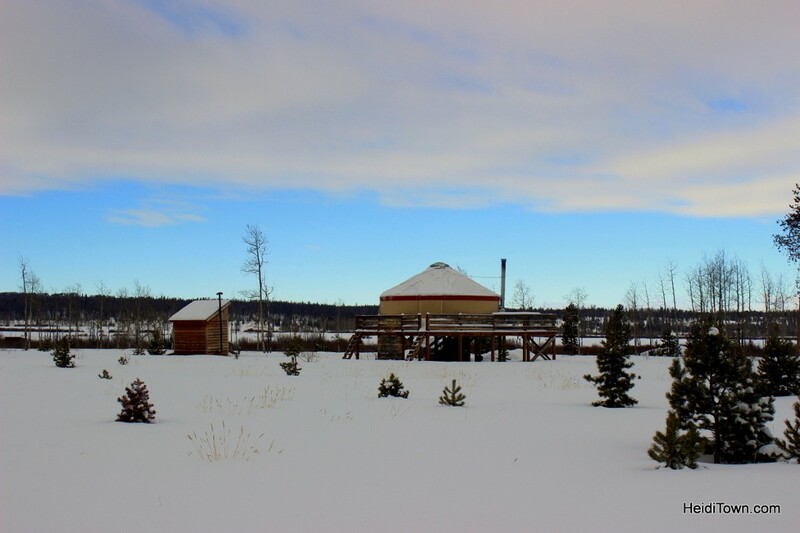 We were booked for one night in the Sunset Yurt, one of three Never Summer Nordic yurts that are located just west of Cameron Pass between Fort Collins and Steamboat Springs, Colorado. 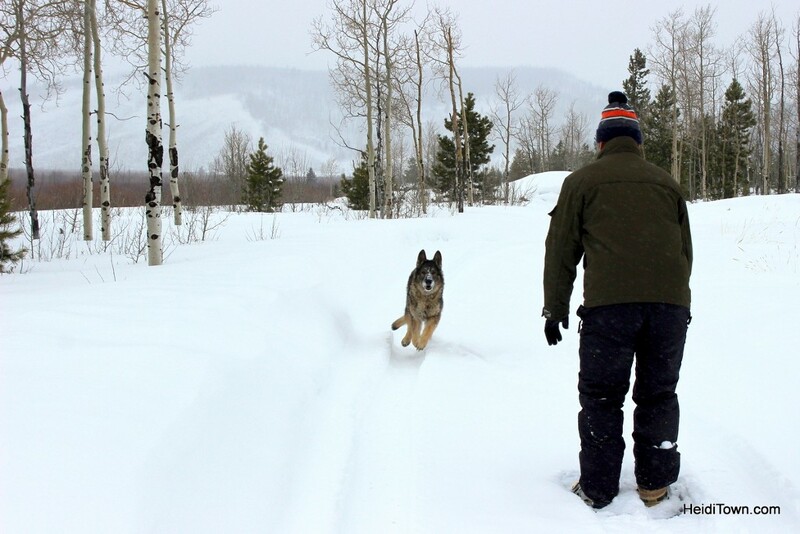 The three yurts at this location (Black Bear, Aspen and Sunset) are the only Never Summer yurts that are dog friendly in the winter and accessible by car year-round. We packed as if we were going camping; something that’s old hat to us as we used to be avid Colorado campers. If we had forgotten anything, we could have picked it up to Jax Mercantile, an outdoor store that’s on the route through Fort Collins to the yurt. 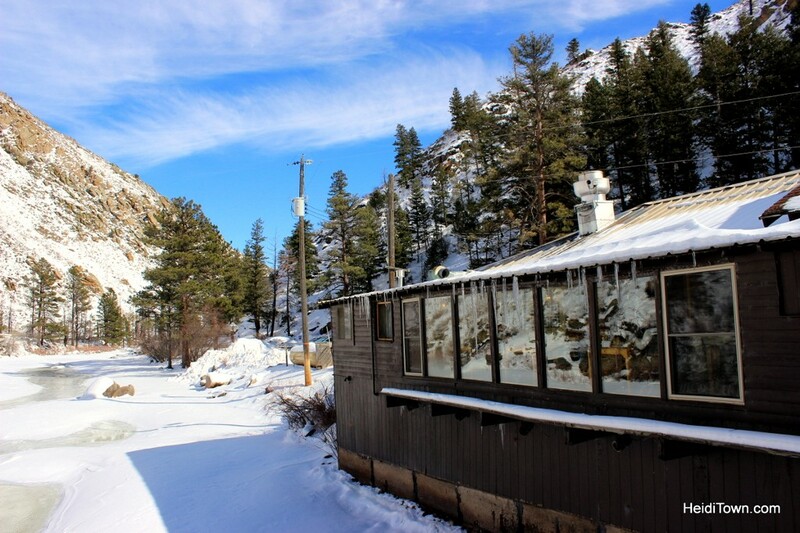 It’s also a convenient place to rent items such as snowshoes or cross country skis for anyone heading up the canyon to play. The drive through the Poudre Canyon along the Poudre River was glorious. In the bright Colorado sunshine, the drive was picture perfect. Best of all, there was no traffic. It was a pleasant change from sitting in ski traffic on I70. As we arrived at our yurt, clouds were beginning to form, and as we exited the car a few flakes were starting to fall. We’d brought along our German Shepherd. A Colorado native, Xena is the ultimate snow dog, and even though she’s old, she still loves nothing more than running through fresh powder. She was in heaven from the moment she exited my Toyota. The yurt life is most definitely Xena approved. We excitedly unlocked the yurt, not really knowing what to expect. We opened the door to what felt like a little house. There was a dining table with bench seating plus chairs as well as a queen bed, futon couch and futon-style chair. The kitchen was actually a bit more luxurious than I had expected. It had two propane burners and there were big tubs for washing dishes and tubs for storing food. Solar powered LED lights have been installed above the kitchen area and above the bed. This was probably my favorite amenity as it was much easier to cook dinner by LED light than by lamplight, plus we discovered our lantern was broken. And this is a good place to stop the narrative and remind you to check your equipment BEFORE you go on a trip. 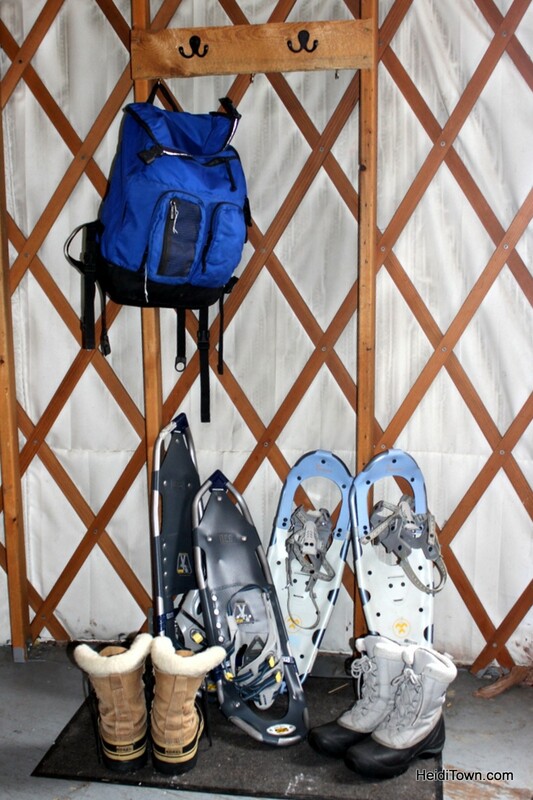 The yurt has a lot of little amenities such as a bench near the fireplace and lots of hooks all around so that guests can hang up wet snow pants, coats, etc. The owners have thought of just about everything. Our first order of business was making a fire because the yurt was cold and thankfully there was plenty of wood in a rack next to the stove. 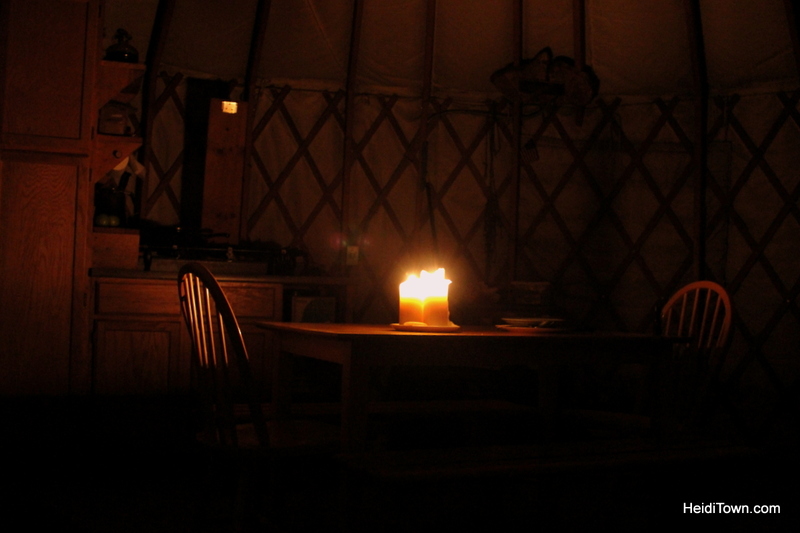 Once we got the stove going the yurt started to heat up and by bedtime the circular enclosure was sweltering. We thought we’d need to dress in layers during the entire stay, but this was not the case. We were peeling off clothes that evening in an attempt to cool off. The one thing that does not heat up are the wood floors, so packing a sturdy pair of indoor/outdoor slippers is a very good idea. At one point, as the yurt was beginning to warm up, a sound that I can only describe as an alien ship landing on the roof startled all three of us. 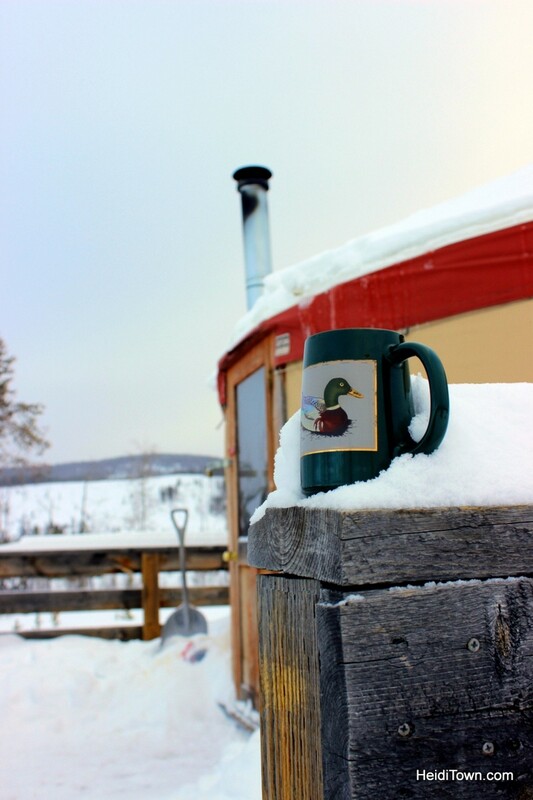 As it turns out, snow does not slide quietly off of a yurt roof. That afternoon we went on a snowshoe trek straight out from our yurt. The snow was deep, so it took some serious trail breaking on Ryan’s part. Xena and I happily trailed behind on the freshly packed snow. Back inside the yurt I made a dinner of chicken tacos. The kitchen area is well-stocked with pots, pans and utensils making it very easy to cook in this yurt. After dinner we read for a while and then I worked up the courage to go use the outhouse in the dark. There is no other way of putting it – I HATE outhouses. I blame the “X-Files.” Does anyone else remember the monster in the outhouse episode? It was terrifying. Thankfully, the Sunset Yurt outhouse is spacious, so I didn’t have the additional discomfort of claustrophobia. It is cold so you must bundle up when heading out to use it at night and a headlamp is a lifesaver. Each of the three North Park yurts have their own outhouse. We went to bed early and Ryan got up periodically during the night to add logs to the fire, but despite these sleep interruptions we still felt refreshed in the morning. Ryan made cowboy coffee in the yurt’s percolator and despite this devise looking like it had been made in 1892, the coffee was very good. It had snowed throughout the night, but the morning showed promising signs of a sunny day. Over a sausage scramble breakfast we talked about how we’d design the inside of our yurt if we had one; walking off the area where we’d put up walls to create a bedroom and bathroom. Staying in the Sunset Yurt made us even more eager to have a yurt of our own one day. After breakfast we bundled up for another snowshoe trek. Thankfully it hadn’t snowed enough to cover up our trail. We were hoping to spot the fox that the former yurt visitors mentioned seeing in their guestbook entry, but having our dog with us lessened our chances of seeing any wildlife. 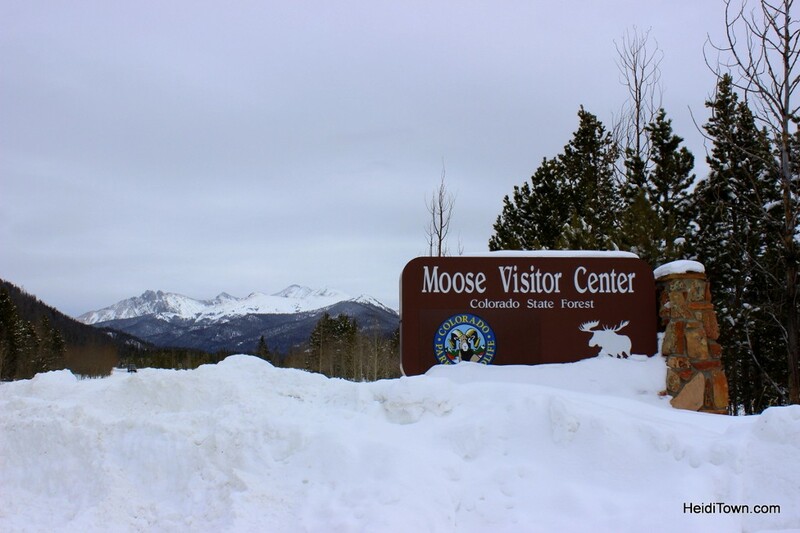 The previous day we had stopped at the Colorado State Parks & Wildlife Moose Visitors Center. 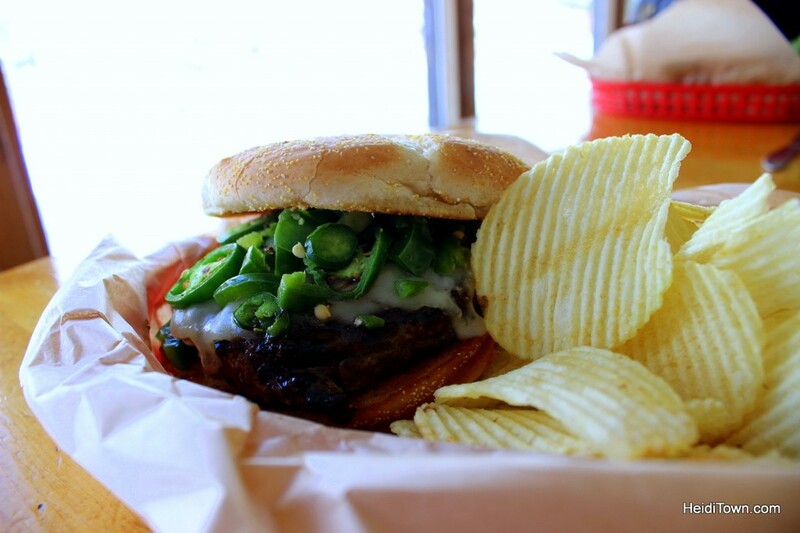 Located three miles east of the yurts on Hwy 14, I recommend dropping by when you’re in the area. They’d informed us that moose sightings were happening in the area nearly every day, but unfortunately we didn’t see any on our trip. Check in at the yurt is at 1 p.m. and check out is at 11 a.m. It took us about an hour to clean up. Ryan cut wood to restock the rack (the wood pile is located under the yurt). I washed dishes using snow melt water that we’d kept warm in a giant stockpot on the stove. 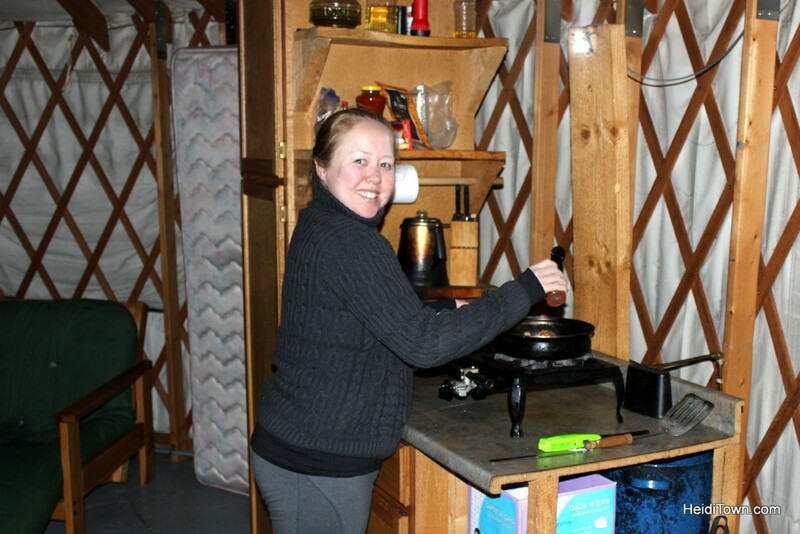 During our stay we kept loading the stockpot with snow so that we always had warm water, which also worked as a humidifier inside the yurt. Surprisingly, these three Never Summer Nordic yurts are not off the grid when it comes to internet. Our phones had three to four bars during the entire trip and I was able to tweet photos to my HeidiTown Twitter followers. On the way home we stopped for lunch at the Mishawaka, referred to by locals as “The Mish.” Incredibly I had never been to this famous landmark that’s best known for hosting amazing bands and making a mean hamburger. While there was no band playing while we were there, my hamburger did not disappoint. 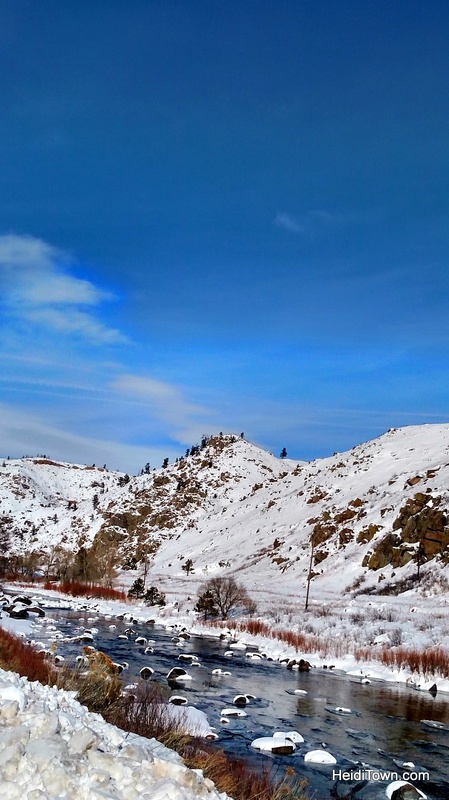 With a gorgeous view of the river, The Mish makes a perfect stop for anyone coming back from a yurt stay, camping trip or just a day hike in the canyon. This March, The Mish is celebrating its 100th anniversary and there are lots of events planned. See their website for details. On our way back through Fort Collins we decided to stop at one of the town’s many breweries. 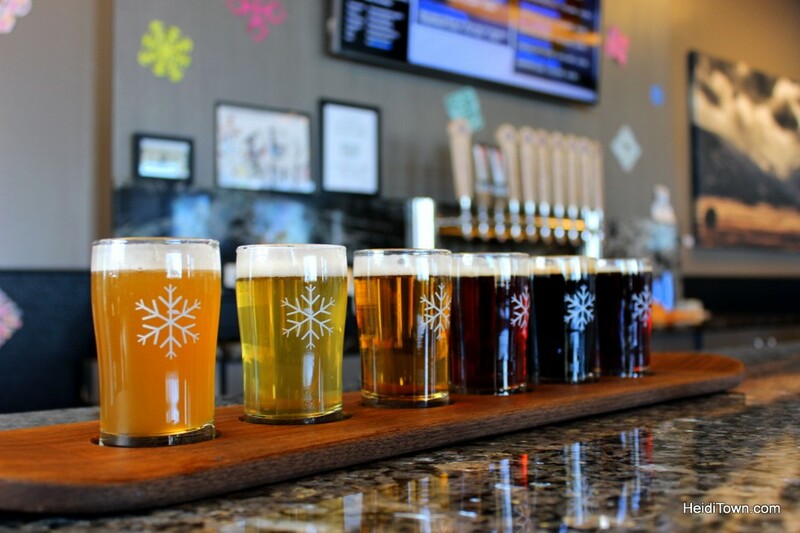 We choose Snowbank Brewing because it’s easily accessible via the route from the Poudre Canyon to the freeway and it has a light and bright ambiance that I love. I also enjoy many of their beers. This dog-friendly brewery is a great respite for anyone coming back from a canyon trip, and a taster flight here is an excellent way to wrap up a wintry Colorado excursion. Thank you to Visit Fort Collins for hosting us on the trip. You FINALLY went to the MISH! You left this out of your retelling last weekend! I wish I could go more often than I do. And, I really do want to do a yurt trip now! Thanks for a great peek into this new travel adventure idea. I think this is the style of camping that you could really get behind! We need to do a trip together this summer for sure. Thanks for this post! I REALLY want to try the yurt life too!